It has been a long time in the making, but today the IE team officially announced the release of the IE Developer Toolbar 1.0. Not much has changed in the toolbar since beta 3; the IE Team post claims that the major changes in version 1.0 are related to performance and "fit-and-finish". And while the performance may have been improved, I think you'll be hard pressed to really notice any fit-and-finish improvements. Nonetheless, this is version 1.0 and if you're a beta user you should probably grab the new bits and make the switch. P.S. It may be old, but it's always...um..."entertaining". Don't miss the Steve Balmer "Developers" video embedded in the post in a Silverlight media control. I was listening to your demo on the bugger tracker thing. 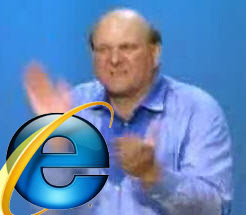 My ie closed on me. I have no clue now where to go to get this. I can not do any kinds of reading on internter or anything cause, internet keeps closing on me. I have tried all kinds of research to fix problem. I can not find any help at all. Please help me. Thank you very much. I'm not sure I understand your question or problem. If you're having problems with IE, I'd suggest you try some of the Microsoft support channels to figure it out. You may also consider downloading FireFox to access the Internet in the mean time.